Bluewater Technologies is one of our oldest trusted production partners. 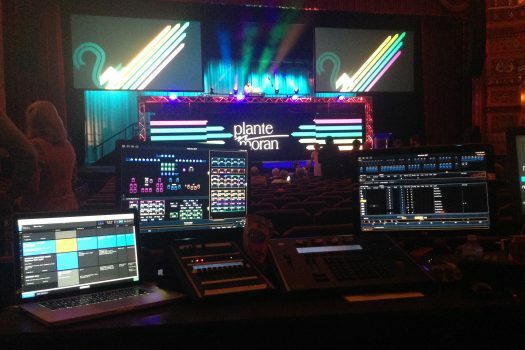 For five years, KBOgroup has provided lighting, show direction, creative direction and stage management for Bluewater’s team for Plante Moran’s annual firm conference. The venue for this conference is both historic and grand: the Fox Theatre in downtown Detroit. It makes an extraordinary backdrop, with its gigantic gilded proscenium and sky painted ceiling. Each year, we help Bluewater and Plante Moran develop a unique, new look to do the impossible: “make accounting interesting”. Plante Moran was the first KBO event to integrate Shoflo Event Production software, which now is standard for every show we do.